Yep, that’s the famous Irish tricolour you see flapping in the breeze. 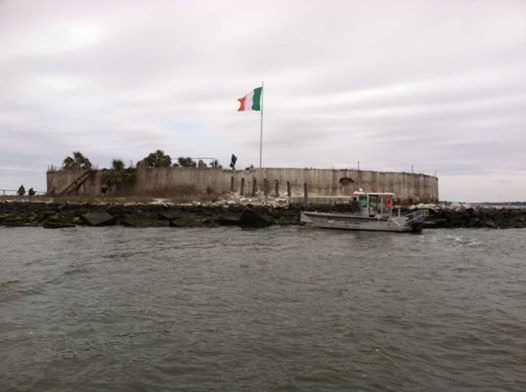 The fort was purchased a while back from the South Carolina State Ports Authority by the Sons of Confederate Veterans Camp 1269 for $10 (read about it here.) They’re the folks who have raised the flag, and according to them they’ve done so in honor of St. Patrick’s Day, a very, very big day in Charleston, if you didn’t know. Visit their preservation site here. This is the second time the flag has flown there. See here for details on the first. You’re right if you’re thinking that this particular flag was not officially in use in Ireland at the time of the Civil War. In 1848, the first Irish tricolour was presented to two visiting Irish nationalists by a small group of French women who were sympathetic to their cause. Those men returned to Ireland’s Waterford City and presented the flag, but it would be another sixty-eight years before it would become recognized as an emblem of the nation, after one was raised over the Dublin Post Office during the Easter Rising. 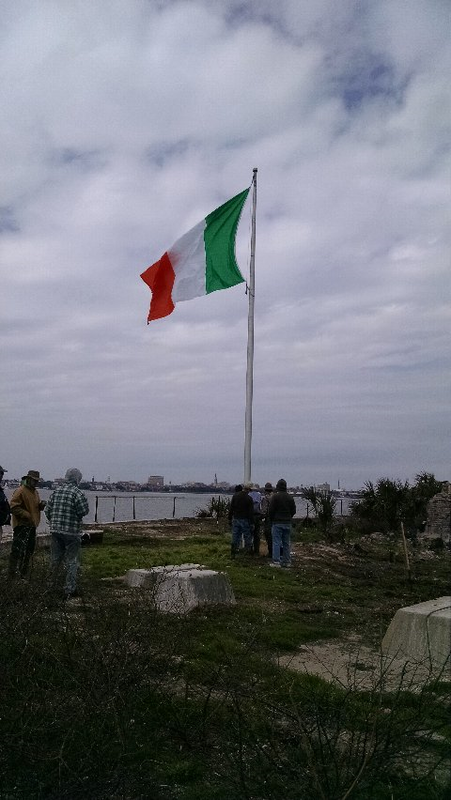 But there are links between the Irish banner and Castle Pinckney in Civil War ways, even if unintentional on the part of the fort’s caretakers. On December 27, 1860, local Charleston militiamen led by (North Carolinian) James Johnston Pettigrew stormed the very lightly defended fort and took possession of it for the state. The three militia units involved were the Washington Light Infantry, the Carolina Light Infantry, and the Meagher Guards. 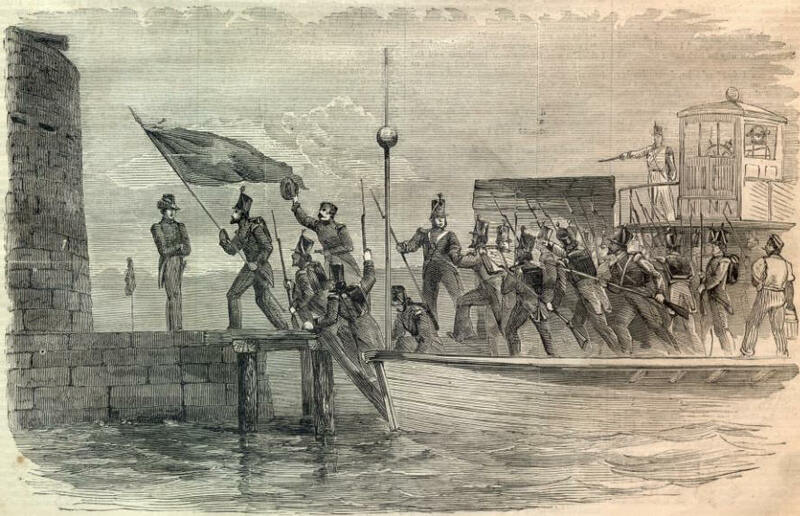 OCCUPATION OF CASTLE PINCKNEY BY THE CHARLESTON MILITIA, DECEMBER 26, 1860. Hmm…Meagher Guards. Tantalizing, yes? 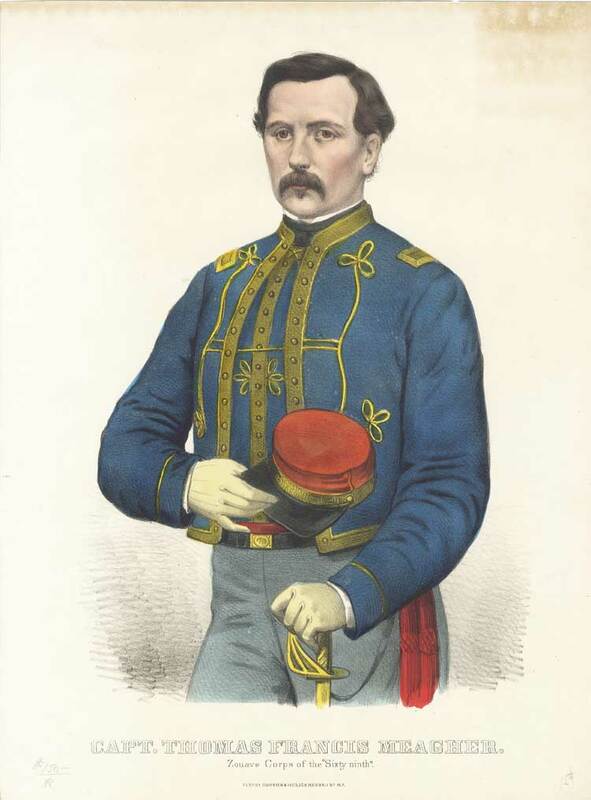 The Guards was a company of Charleston Irishmen, which had named itself in honor of Thomas Francis Meagher. Yes, that Thomas Francis Meagher. In 1853 Meagher, on the lecture circuit, delivered a St. Patrick’s Day speech to Charleston’s Hibernian Society so stirring that – according to Donald Williams, the Society’s current historian and author of Shamrocks and Pluff Mud – an honorary membership was conferred on him. Of course, at the time Meagher (an acting major with the 69th New York State Militia at First Bull Run) was still famous as an Irish patriot, and not as the Union general he would become. The Hibernians revoked Meagher’s membership in 1861 as his role in the Union war effort became more prominent. The Meagher Guards became the Emerald Light Infantry (see here.) According to Irish-American Units in the Civil War they eventually formed part of Co. K. of Maxcy Gregg’s 1st South Carolina Volunteers. Now here’s where it gets freaky. Care to guess who was one of the two young Irish nationalists that accepted the tricolour from those French women back in 1848? That’s right, non-other than Thomas Francis Meagher, who had yet to be exiled to Tasmania and escape to the United States. 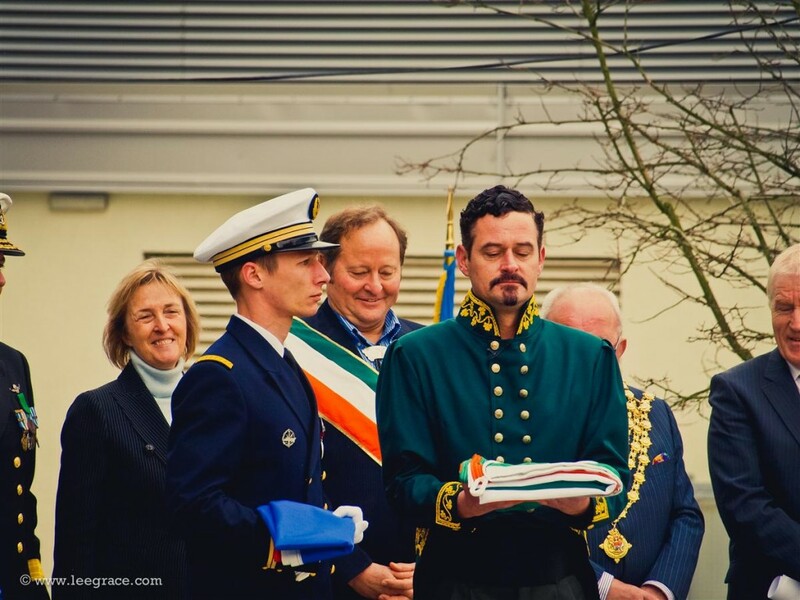 His unveiling of the flag in Waterford City is celebrated annually (this year’s festivities are being held today and tomorrow – see here.) How about that? Also, photographic evidence shows that some members of Meagher’s unit captured at Bull Run were indeed held in Castle Pinckney (the regiment at Bull Run was the 69th New York State Militia, not New York Infantry.) Meagher was captain of Co. K, a zouave group. 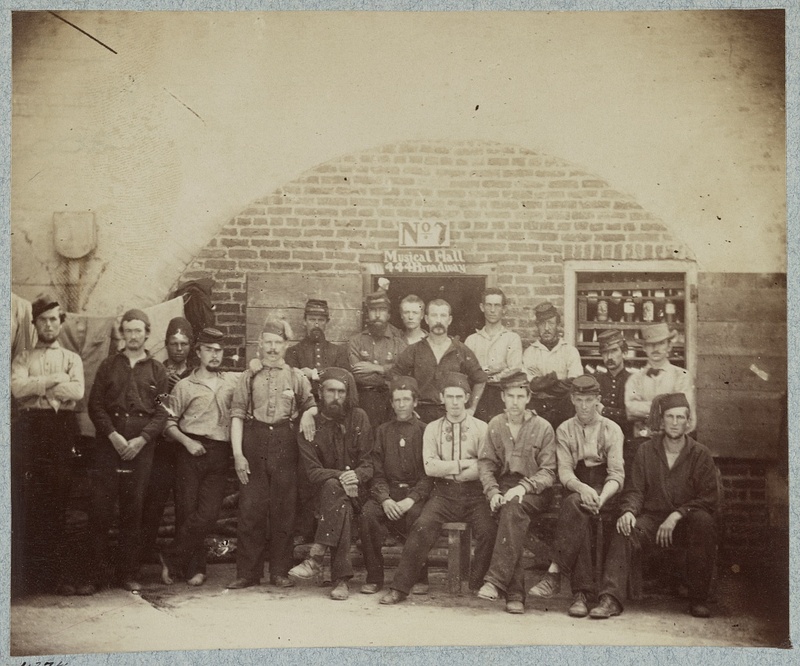 I think the fella fourth from right, seated, is a good candidate for a member of Co. K.
Summary: Photograph shows group from the 69th New York Infantry [sic] (Fighting 69th), some seated, others standing in the rear, facing front. A sign above the door, No. 7 Musical Hall, 444th Broadway. Here is a list of the 69th’s prisoners that their colonel, Michael Corcoran, sent home from Richmond. There are three from Co. K. No telling if any of them wound up at Pinckney. So it would appear altogether fitting and proper that this flag should fly at this place at this time, don’t you think? Excellent! Thanks for this, Harry. I enjoyed it immensely. Glad you liked it, Joe! No. Americans cannot fly the historic Confederate flag but they can fly the foreign one ? Reality check please. A foreign flag is flown but an historical American flag such as any Confederate flag is banned even for one day. Seems wrong.